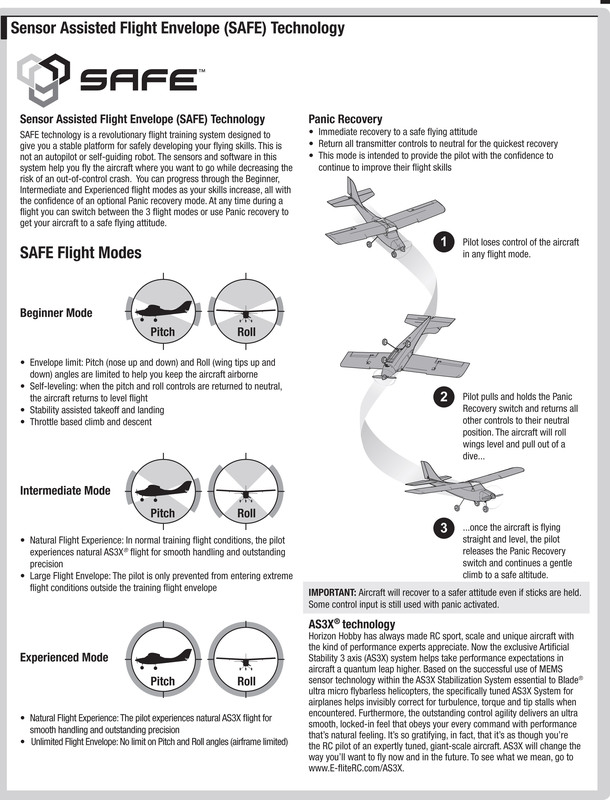 Safe mode stands for Sensor Assisted Flight Envelope. It limits the control surface deflection based on the flight mode the plane is in. The specifically tuned AS3X System for airplanes helps invisibly correct for turbulence, torque and tip stalls when encountered. When you move the aircraft and the surfaces move the other direction, that’s AS3X in action, Its NOT Safe. Which makes it critical that the student and trainer are able to correctly program TX to take advantage of the built in flight modes. The TX bound to the Apprentice ( Trainer TX ) MUST be setup to take advantage of the flight modes etc. The trainee TX is then bound to the Trainer TX using the wireless setup steps below. On the trainee TX, you just need to create a new blank Acro model. 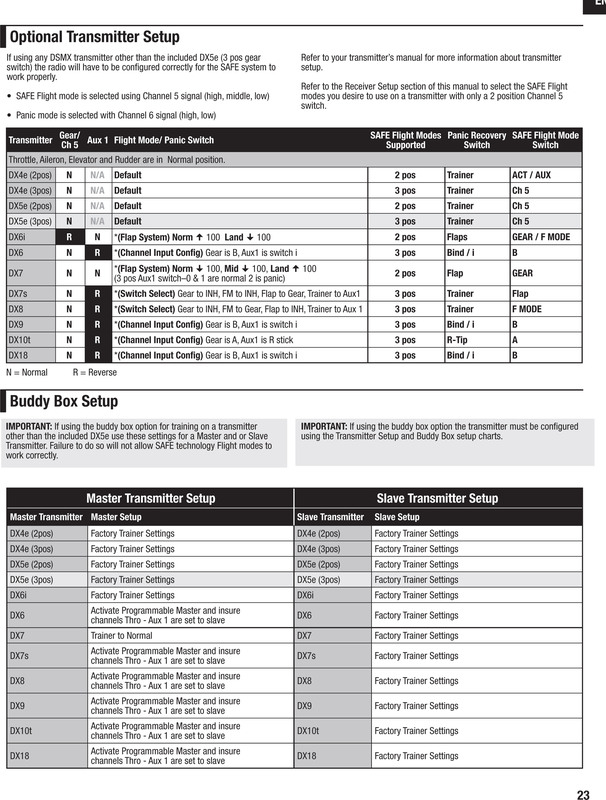 The easiest way to setup the flight modes for the Apprentice for the Trainers TX is to use a premade SPM file if you and or the Trainee are using a DX6-DX9 or DX18. Spektrum doesn’t offer a download for the Apprentice but Ive shared one here that I have used and works. As usual make sure the control surfaces are working as expected. The Bind button will be the panic mode. If you mode Aux Channel to another switch you can avoid holding the bind button while training. You can also setup your radio so as soon as you move the sticks you regain control - You do this by setting the master override feature on the master TX. Make yourself familiar with your transmitter’s controls and the aircraft’s response before flying by performing the recommended Control Direction Test. The flight trim buttons are used to fine tune your aircraft for straight and level flight. 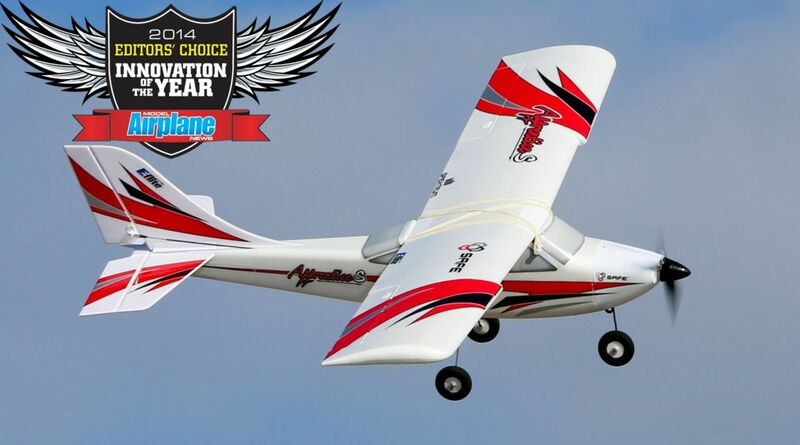 When trimmed correctly, your aircraft flies a straight path with wings level, steadily climbs at full throttle, maintains a constant altitude at half throttle, and gently descends at low throttle. 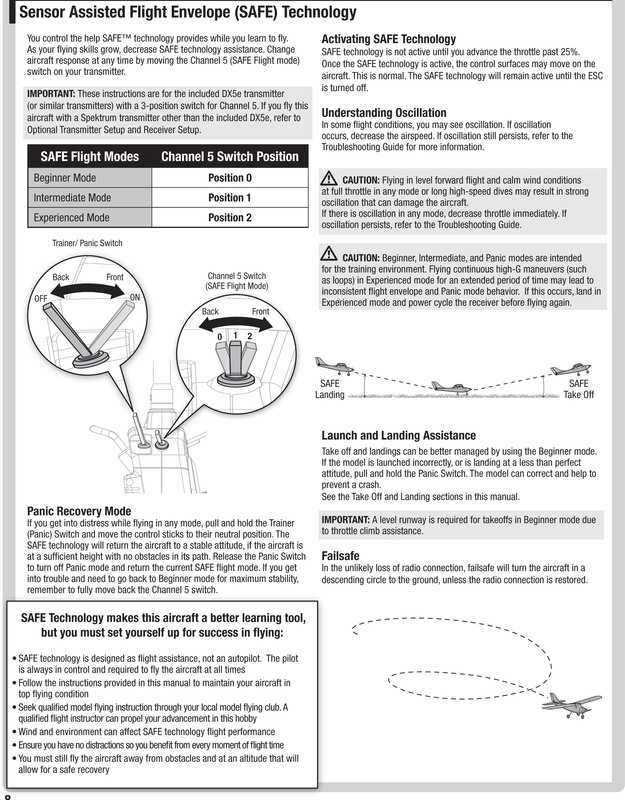 SAFE technology must learn your aircraft trim values to ensure consistent flight behavior. The trim values are learned when the receiver initially powers up. If you need to adjust the trim values in flight, set the aircraft to half throttle, make the necessary adjustments using the flight trim buttons, then keep the throttle position constant and the aileron, elevator, and rudder controls at the neutral position for 3 seconds. If you need more than 4 clicks on a trim button to make the aircraft fly straight and level at half throttle, you should mechanically adjust the control surfaces as shown in the control surface centering section. 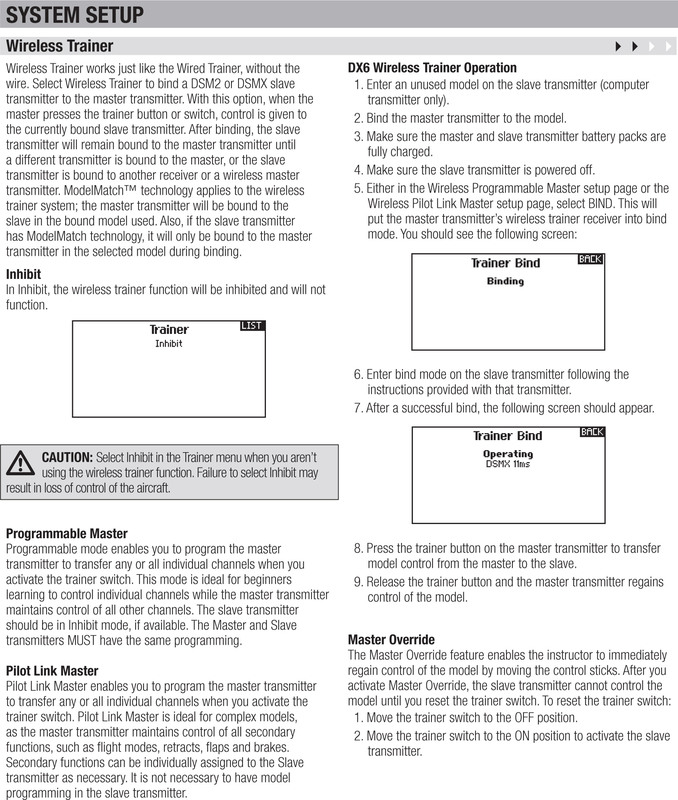 "On the master transmitter, you have two options for how to set up the trainer mode - "Pilot Link Master" and "Programmable Master". When it's set for "Pilot Link Master", the student controller is essentially a set of sticks. The master controller needs to have all of the correct programming to fly the aircraft, but you set up a plain, default airplane (acro) model on the student's controller. The master controller handles all of the dual rate, expo, trim, mixing, or anything else you need to fly. In this mode, the master controller is taking raw inputs from the student controller and applying its programming before sending the information up to the aircraft. In contrast, "Programmable Master" mode requires both the master controller and the student controller to have all of the programming. In this mode, the master controller is really just a pass-through device, sending the data from the student controller up to the aircraft unchanged. For both modes, you'll see a screen full of on/off switches that lets you control which channels the student is allowed to control, and which channels the master controller will have at all times, even when the student has control. This lets you choose whether the student will be able to control the flight mode (Gear channel) or panic button (Aux1). If I remember correctly, Pilot Link Mode defaults to only the four stick channels enabled for the student, and Programmable Mode defaults to having all channels open for the student"